"The Victorian era in literature refers to the time that Queen Victoria was ruling in Britain (1837-1901). It was a time period of great peace and prosperity for Britain and allowed for a lot of artistic and literary expression. Generally speaking, Victorians are only the British authors who published during this time period. However, some like to group American writers and others into the mix since their work can be closely tied together. To give you an idea of what writers I am talking about, some of the most well-known Victorian writers include: Charles Dickens, George Eliot, Wilkie Collins, William Makepeace Thackeray, Anthony Trollope, and the Bronte sisters. Others include Lewis Carroll, Robert Louis Stevenson, Anna Sewell, and the Brownings. There are countless more, but these are the big hitters and those most commonly referred to as Victorians. 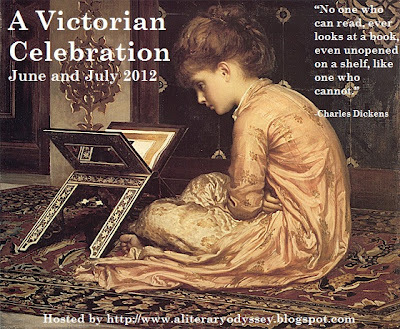 For this event, the goal is to read as many Victorian pieces as you wish during the months of June and July. 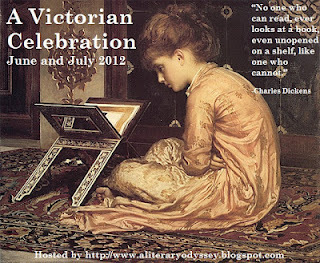 I will have posts going up throughout the event on different authors, as well as my own reviews on Victorian pieces and biographies of writers. There will also be prizes (lots of them) that will go up throughout the two month event. If you are going to participate, you can read a novel from the era, a biography on a writer or Queen Victoria herself, or anything else pertaining to the era. All posts will help you qualify for prizes, which I'll explain as we get closer to the event's starting line!" Interested in participating? Signup here. Yay! I'm glad you're joining in! Really looking forward to it, Allie.